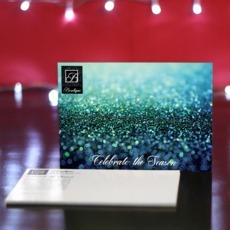 Greeting cards are evergreen way to send your message across places. Whether you are designing these cards for personal or business use, you should always make sure that you create good designs and be able to send them right away! Go to our website and log-in or create a new account. Navigate our calculator at the ride side of your screen and upload your file to place an order. Your file will be checked by one of our pre-press specialists to make sure that it is print-ready. If there are minor discrepancies, a free proof will be attached to your account for approval. We will start printing your greeting cards according to your desired specs upon your approval and payment. 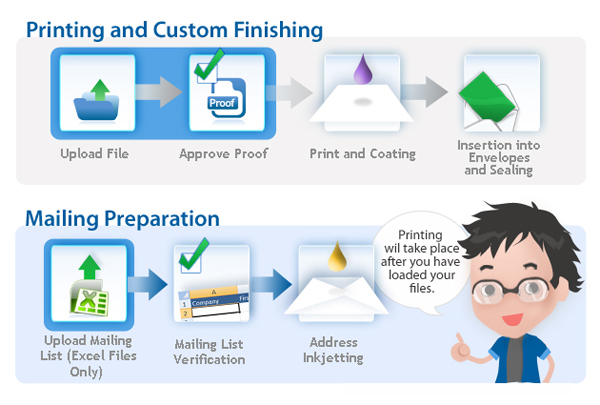 Once we’re done with the printing, we'll request from you a list of your recipients. We'll print their names and mailing addresses on individual envelopes. If you need to send your greeting cards right ahead, you should go for First Class Mail. First Class Mails reach recipients in 3 to 5 business days. If you send them through Standard Bulk, it takes 5 to 14 business days to be delivered. Standard Bulk mailing service is convenient to senders who are not in the middle of a deadline; and is more affordable then first class mails. Turnaround time is directly proportional to location - the smaller the area, the faster the turnaround time. Please take note that there may be delays due to unforeseen events that are beyond human control, such as adverse weather. It is very common that customers relocate. This means that there is always the possibility that addresses on your mailing list will not match that of your customers' current addresses. To lessen non-deliveries, you can choose either to have your mailing list updated or just have your cards delivered as is. The first option, NCOA or National Change of Address, is the process of updating the client's mailing list based on the postal record of those who filed a change of address. It will allow us to deliver your cards to your customers' new addresses. This option is necessary if the greeting cards you are sending out have been customized for a particular set of consumers. The second option, OCO (Or Current Occupant), allows us to print “Or Current Occupant” under the delivery name. Your greeting cards will be sent to the delivery address regardless of who the occupant is. This option is good for businesses that are in search of new customers. We also offer split shipping. If you choose to pay for this service, we will deliver unsent greeting cards or a certain portion of the total percentage of prints back to you. This option is great to save the unsent prints or for instances when you want to hand deliver them yourself. 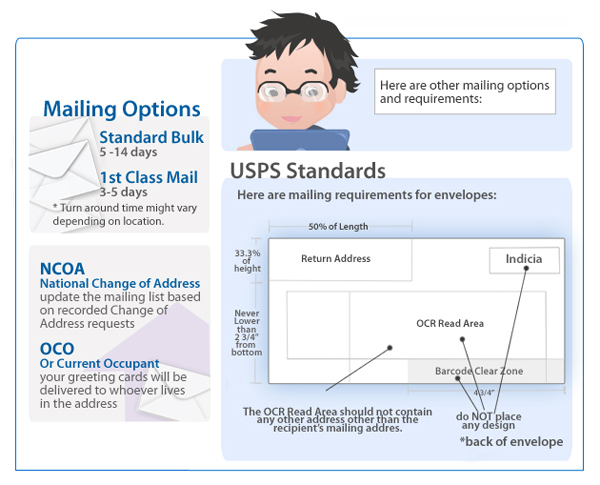 The United States Postal Service requires certain layout for envelopes and self-mailers. Following their standards not only secure delivery but also makes the process faster since it makes the job easier both for their machines and staff to sort and mail them out. One requirement is to keep certain areas in the envelope blank and devoid of any design element, including colors. These parts include the bar code clear zone, OCR Read Area and Indicia. Another issue that could affect mailing is putting addresses at the direct left of the OCR Read Area since it could confuse the machine that sorts mails. Also, return addresses should always be at the top left to avoid confusion from the delivery address. After we have finalized all the details of your job order and mailing service, we are off to distribute your greeting cards! For more questions about greeting card printing and mailing, don’t hesitate to contact us at 1.888.888.4211 or through our Live Chat.